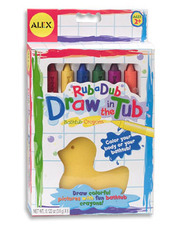 Bath crayons are so much fun for everyone in the tub. They make bath time exciting. These make a great add on toddler gift, a fantastic stocking stuffer or kindy gift/class mate gift. They are also great to split up an use as a reward for todder toilet training or other rewardable occasion. Tip: We give our little misses one or two colours at a time to make the packet last longer. As they always end up left under water which shortens their life (like soap they disintegrate). Suitable for age: 2 year(s) and up.